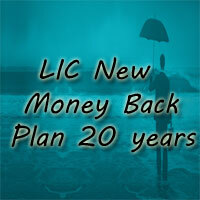 LIC New Money Back Plan 20 years is a Non-linked Participating Insurance Plan. It Offers an attractive Combination of Protection against Death along with the Guaranteed Returns at Specified Durations on Survival of Policy Holder during the Policy Term. By Taking the LIC Money Back Policy 20 years, Policy Family of the Deceased Policyholder can get the Financial support at any time before Maturity and gives you lump-sum Amount at the Time of Maturity on Surviving of the Policyholder. This plan also takes care of liquidity needs through its loan facility. Death Benefit: On the Death of the Life Assured Nominee will receive the Death Benefit which can be Defined as the Sum of “Sum Assured on Death” and Vested Simple Reversionary Bonuses and Final Additional Bonus, if any, shall be payable. Sum Assured on Death = 125% of (Basic Sum Assured) (or) 10 times of Annualized Premium. Survival Benefit: In the case of Survival of the Life Assured on the Completion of Maturity Period Policyholder will receive Survival Benefit of 15% of the Basic Sum Assured at the end of the specified Durations like 5th, 10th, 15th & 20th policy year. Maturity Benefit: On the Survival of the Life Assured on the Date of Maturity, 40% of the Basic Sum Assured along with the Simple Reversionary Bonuses and Final Additional Bonus will be payable as Maturity Benefit. Participation in Profits: Depending on the Corporation Experience the Policy shall participate in profits of the Corporation and shall be Eligible to receive Simple Reversionary Bonuses at such rate and on such terms as declared by the corporation. Final Additional Bonus may also be declared under the policy in the year when the policy results into a claim either by death or maturity provided the policy has run for the certain minimum term. LIC Money Back 20 years Plan is a New Money Bank Plan introduced by the Life Insurance Corporation of India to provide the Combination of Death Benefit along with the periodic payment on Specified Durations. Policy Holders can get the additional LIC’s Accidental Death and Disability Benefit Rider by Payment of Additional Premium. Simple Reversionary Bonus and Final Additional bonus is payable on Policy Maturity or on earlier death. The Optional higher cover will be available through Riders. The Policy can be Surrendered at any time during the policy Term after the Successful Payment of Premiums for three full years. Guaranteed Surrender Value is Payable to the Policy Holder on Surrendering the Policy. This Policy also provides Loan Facility to the Policy Holder after the policy acquires paid up value. Minimum: Rs. 100,00/-Maximum: No Limit. Maximum Maturity Age 70 years. Premium Paying Term 15 years. By Using the LIC Money Back Policy 20-years Premium Calculator, You can calculate the Minimum Premium that has to be Paid to take the Policy. The Amount of Premium Paid will depend on the Premium Payment Modes that you have chosen. You need to enter Some Basic Information like Name, Mail Id, Mobile Number, Age, Policy Term, and Minimum Sum Assured to calculate the Premium Value. Life Insurance Corporation of India is offering a Special “Accidental Death and Disability Benefit Rider” under this New Money Back Plan 20 years (Plan No. 820). By Paying Additional Premium, Policy Holder can avail this “LIC’s Accidental Death and Disability Benefit Rider“. People who wish to get the LIC Accidental Death and Disability Benefit Rider should meet the below Eligibility Conditions. Minimum Entry Age: 18 years. Maximum Entry Age: The cover can be opted for at any policy anniversary during the premium paying term. Maximum Cover Ceasing Age: 70 years (nearest birthday). Maximum Accident Benefit Sum Assured: An amount equal to Basic Sum Assured subjected to the maximum of Rs. 100 Lakhs overall limit by taking all existing policies of the Life Assured under individual Policies as well as Group policies. LIC provides Rebates for the Policyholders under this Policy. Rebate means getting a discount on tabular premium as per the payment mode of the policy. Which means, if one pays annually instead of quarterly or monthly the premium would be 2% lower for the same Sum Assured. The Rates of Rebates for LIC New Money Back Plan 25 years is given below. Half-yearly: 1% of Tabular Premium. Quarterly & Salary Deduction: NIL. Rs. 5,00,000/- and above NIL. 2% of Basic Sum Assured. 3% of Basic Sum Assured. You can Buy the LIC New Money Back Policy 20-years from the Nearest LIC Branch Office or through online at the LIC’s Official Website or From the LIC Agent. The Documents required for buying LIC New Money Back Plan 20 years are listed below. The Claims available under LIC New Money Back Policy 20 years are Maturity Claim and Death Claim. Maturity Claim: Sum Assured – Survival Benefits + Simple Reversionary Bonus + FAB (final additional bonus) if any will be payable on the Maturity of the Policy. Death Claim: 125% of Basic Sum Assured (1.25 x BSA) or 10 times Annual Premium (10 x AP) whichever is higher that amount will be paid to the nominee on Sudden Death of the Life Assured. Death benefit paid should be more than 105% of total premiums paid as on the date of death. Policy Loan: Loan facility is available under this plan after the policy has acquired a surrender value. The terms and conditions as the Corporation may specify from time to time. Policy Revival: LIC New Money Back Plan 20 years can be revived before two years from the date of First Unpaid Premium (FUP). Riders: A Special ” Accidental Death and Disability Benefit” Rider is available under this Plan. Grace Period: A Grace Period of one Month but not less than 30 Days will be allowed for Yearly, Half-yearly, Quarterly Modes and 15 Days for Monthly Mode of Premium Payment. Paid-up Value: If the Policy Holder has paid Premiums for at least Three Full years and any Subsequent Premiums be not paid, the Policy will be still Valid and will be treated as Paid-up Policy. The Basic Sum Assured under this Paid-up policy will be reduced to a Sum which is called as Paid-up Sum Assured. The LIC Money back policy 20 years policy can be surrendered at any time during the policy term by Successful Payment of Premiums for three full years. Guaranteed Surrender Value, which is the Percentage of the Total Premiums Paid excluding Total Premium Paid and Premiums for Riders, shall be payable on surrendering of the Policy. Taxes: Taxes including Service Tax and any Other Taxes on premiums including extra premiums shall be Payable by the Policy Holder as per the Tax Laws and the rate of Tax shall be as applicable from time to time. Cooling-off Period: If the Policy Holder is not satisfied with the Terms and Conditions of the Policy, Policyholder can return the Policy within 15 Days from the date of receipt of the Policy Bond. If the Life Assured commits suicide at any time within one year / 12 months from the date of commencement of risk, the Corporation will not entertain any Claim, but the Corporation will give you 80% of the premiums paid excluding any taxes, extra premium and rider premiums. If the Life Assured commits suicide within 12 months / one year from date of revival, an amount which is higher of 80% of the premiums paid till the date of death (excluding any taxes, extra premium and rider premiums, if any,) or the surrender value, provided the policy is in force, shall be payable. Ans. It is the Locking Period, in which the Policyholder can return his Policy if he does not Satisfied with the Terms and Conditions of the Policy. 2. Can I Revive My LIC New Money Back Plan 20 years? Ans: Yes, you can revive your Lapsed Policy within two consecutive years from the Date of First Unpaid Premium. 3. Is Loan Facility available under this Policy? Ans: Yes, Loan Facility is available under this Plan after the Policy acquires a Surrender Value. 3. What is the Grace Period available for this Policy? Ans: A Grace Period of 1 Month not Less than 30 Days is available for Yearly, Half-yearly Premium Payment Modes and 15 Days for Monthly Mode of Premium Payment. 4. What happens, If I Want to Surrender my LIC New Money Back 20 years Policy? Ans: You can avail the Guaranteed Surrender Value on Surrendering the LIC New Money Back Policy 20 years at any time during the Policy Period. Guaranteed Surrender Value = 30% of all premiums paid – 1st year’s premium.